There are 18 Assisted Living Facilities in the Anchorage area, with 17 in Anchorage and 1 nearby. To help you with your search, browse the 6 reviews below for assisted living facilities in Anchorage. On average, consumers rate assisted living in Anchorage 3.8 out of 5 stars. Better rated regions include Wasilla with an average rating of 5.0 out of 5 stars. Caring.com has helped thousands of families find high-quality senior care. To speak with one of our Family Advisors about assisted living options and costs in Anchorage, call (855) 863-8283. Anchorage, Alaska, is the premier spot for nature lovers who marvel at the serene waters of the Cook Inlet and the majestic views of The Chugach Mountains. Also in the town is Chugach State Park and Chugach National Forest, both with many access points for residents to enjoy the outdoors all day. Seniors living here, 8 percent of the population, will also find 17 assisted living facilities in Anchorage and one nearby to help with activities of daily living. Assisted living facilities in Anchorage are licensed by the Department of Administration and the Department of Health and Social Services. Anchorage is rich in arts and culture. Seniors can explore Alaska’s heritage at the Anchorage Museum and the Alaska Native Heritage Center. Anchorage is also home to Cyrano’s Theatre Company, which features a new play approximately once a month. It’s convenient and affordable to get around Anchorage, thanks to the city’s People Mover bus system. Seniors age 60 and over are eligible for half-price fares. Like the rest of Alaska, there’s no tax on Social Security benefits in Anchorage. The state also has no sales tax or estate tax, making it financially friendly for seniors. Anchorage gets 102 inches of snow per year on average and has fewer sunny days as compared to the rest of the United States. Sperling’s Comfort Index for Anchorage is 44 out of 100, with the national average coming in at 54. The air quality in Anchorage is relatively poor as compared with other cities. Anchorage ranks 14 on the American Lung Association’s list of Most Polluted Cities for short-term particle pollution. It also has an air quality rating of 38, which is lower than the U.S. average of 58. Anchorage has a violent crime rating of 66.5 and a property crime rating of 47.9. These figures are higher than the national averages of 31.1 and 38.1, respectively. Assisted Living costs in Anchorage start around $0 per month on average, while the nationwide average cost of assisted living is $4,000 per month, according to the latest figures from Genworth’s Cost of Care Survey. It’s important to note that assisted living rates in Anchorage and the surrounding suburbs can vary widely based on factors such as location, the level of care needed, apartment size and the types of amenities offered at each community. Anchorage seniors may qualify for financial assistance to help pay for assisted living. 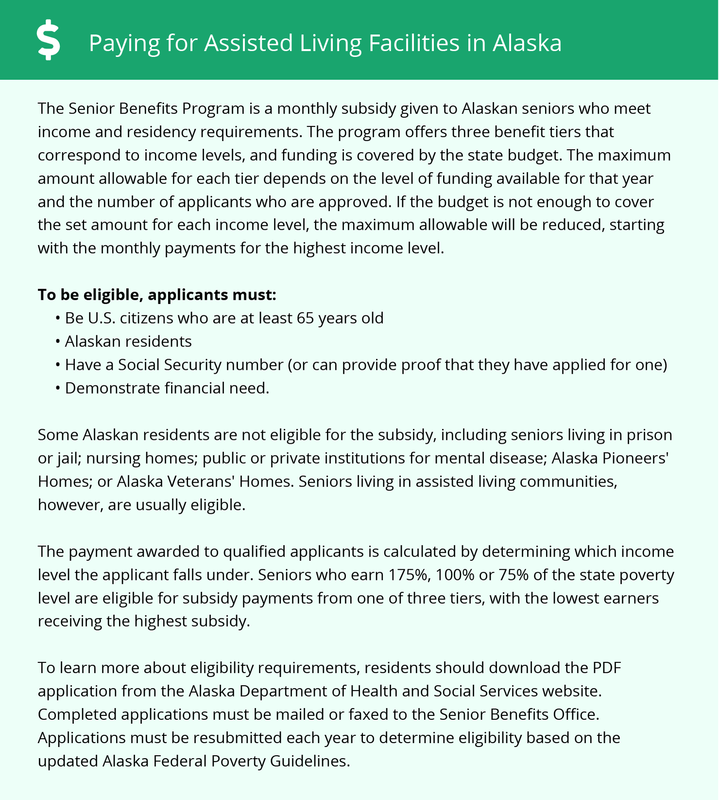 The Alaska Department of Health and Social Services has a Senior Benefits Program for residents 65 and older. In addition, Alaska residents receive an annual dividend payment that can be used however they choose. Learn more about these programs, plus who’s eligible, on our Assisted Living in Alaska page. For more information about different ways to finance assisted living, visit our Assisted Living in Alaska page. Anchorage and the surrounding area are home to numerous government agencies and non-profit organizations offering help for seniors searching for or currently residing in an assisted living community. These organizations can also provide assistance in a number of other eldercare services such as geriatric care management, elder law advice, estate planning, finding home care and health and wellness programs. To see a list of free assisted living resources in Anchorage, please visit our Assisted Living in Alaska page. Anchorage-area assisted living communities must adhere to the comprehensive set of state laws and regulations that all assisted living communities in Alaska are required to follow. Visit our Assisted Living in Alaska page for more information about these laws.